Environmental control policies can be difficult to navigate, but ensuring your business meets the required standard of your local environmental protection agency when storing and dealing with toxic solutions is vital for the success of your business and health of the planet. There are various storage solutions available for environmental contaminants, but the right options for your business will vary depending on location, nature of the business and type of chemicals, so do ensure you seek professional advice regarding compliance. The following list of storage solutions will provide some information on what's available and when they might be useful. 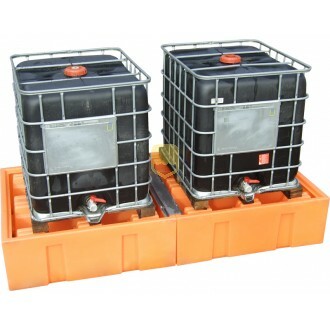 If your business uses large quantities of toxic liquids such as oil or fuel that you store in drums or barrels holding more than twenty-five litres you are required to store these barrels on containment units such as spill pallets that will minimise the impact of leaks or spills. Spill pallets typically have raised sides or a gridded floor and are available in a range of sizes to accommodate the needs of small and large businesses. They keep your barrels off the floor on a raised tray that can hold the contents of the barrel in the event of a leak and many models come with covers for effective use outdoors. 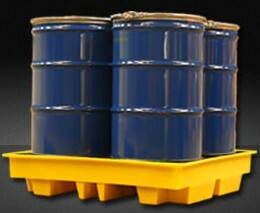 Drip trays can also be an effective storage solution when you use smaller containers of hazardous fluids. They can protect work surfaces and employees by catching spills of liquids that are kept on workstations for regular use. Ensure you use a tray that is big enough to catch the contents of the bottles you store on it and don't store more bottles on the tray than it was designed to hold. There are several storage options available for high risk liquids, which can pose the risk of contamination to the environment and injury if not stored safely in suitable containers. Durable plastic tanks are a great way to store substances such as oils as long as your storage location is not in close proximity to a water supply. These tanks come in various sizes and models to facilitate vertical or horizontal storage. If you need to store a liquid in a quantity that exceeds 500 litres a bunded tank may be the ideal solution. Essentially, a bunded tank is a tank within an outer tank, which is called a bund. The bund can hold more than the total capacity of the inner tank, so if the inner tank springs a leak the bund will be able to absorb the entire contents of the tank. Many bunded tank models have a dispensing pump for ease of use and they are available in various sizes. Lastly, drums are ideal for storing between 30 and 220 litres of hazardous liquids and are available in plastic and steel. The type of drum you require is dependent on what you intend to store in it, but both are available in open head and tight head variations. Tight head models have lids that can't be removed completely, but have bung holes that pumps or taps are fitted to for the filling and emptying of the contents. When purchasing any environmental protection storage products use a reputable supplier to ensure that the products meet the quality and legislative requirements set out by the Environmental Protection Agency. Ilena Sanchez writes regularly on a variety of topics encompassing environmental policy and business and has reviewed a number of liquid storage solutions such as spill pallets for a range of specialist websites and blogs.